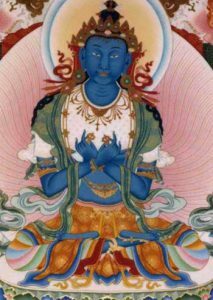 Although Buddha Shakyamuni manifested enlightenment in the nirmanakaya form in India over 2500 years ago, the nature or essence of that enlightenment is dharmakaya. That buddhahood appears, according to the capacity of beings to be guided, as sambhogakaya or nirmanakaya, as in the case of Buddha Shakyamuni. As the source however is always dharmakaya, or Vajradhara, it is this reality that is seen as being the wellspring and the life-blood of the Kagyu. Therefore, not only does Vajradhara head the lineage trees of the Kagyu schools, but this realisation is seen to be the living achievement of lineage masters, right up to the present day. Usually personified as a blue figure in sambhogakaya attire, Vajradhara (dharmakaya) is seen to be synonymous both with the nature of a practitioner’s own mind, and that of the Lama. The non-duality of this relationship facilitates the transmission of realisation from master to disciple; something that has become a hallmark of the Kagyu masters, whose songs of realisation, yearning and devotion echo through the centuries.